Glass Saws (frequently called cut-off wheels) are quite common in the glassblowing shop. This piece of equipment may be used to cut full lengths of glass tubing and rod down to a manageable size, cut angles (drip tips), remove damaged glass from an apparatus in preparation for repair, and a host of other applications. Most cutting wheels are made with carborundum abrasives or industrial diamonds. 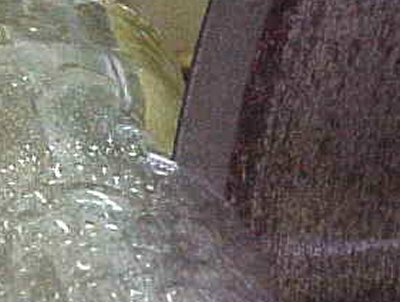 All glass saws of this style will use a coolant, usually water, to keep the glass from fracturing due to heat build-up at the wheel/glass contact point. 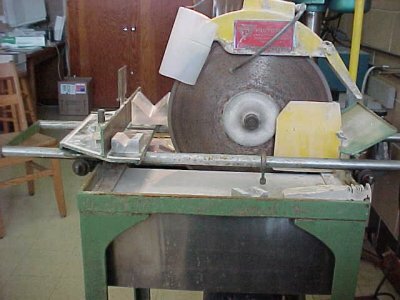 Here we see an example of a typical glass saw or cut-off wheel with a diamond wheel installed. This particular saw was made by Pistorius Machine Company which, alas, went out of business sometime in 2011. A coolant reservoir, mounted within the green framework, provides water to a pump which in turn feeds the copper tubes mounted on either side of the diamond wheel. The water flows down onto the rotating wheel, running out to the wheel edge, cooling both the wheel and the glass being cut. 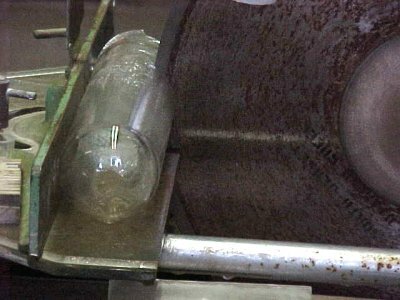 This photo shows a glass tube being cut on the movable table. Notice the glass is in contact with at least two places on the table - the bottom and back. For safety as well as cut quality, the glassware should always be firmly held against a solid backing (the table). The entire table with the glass is then brought into the saw wheel. "Freehanding" the glass into a rotating wheel is not recommended! Diamond wheels are initially expensive relative to the cost of carborundum wheels, but have the advantages of lasting much longer, retaining wheel diameter, and maintaining their cut profile. The wheels can be manufactured with different diamond sizes, concentrations and bonds, allowing the user to tailor them for his or her specific applications.